Q: If the insurance company's estimate is lower than that of your choice of shops, you must pay the difference ? A: According to state law, your insurance carrier must negotiate in good faith with your choice of shop to arrive at an agreed price for repairs. It is the role of the professional collision repairer to be an advocate for his or her customer by working with an insurer to document and identify physical damage. Because of our exemplary relationship with area insurers, and our commitment to our customers, R & D Collision Center will never charge an amount higher than that paid by an insurance company for the repair of damage attributable to a specific claim. Policyholders are only responsible for their deductibles. Q: Once an insurance company issues a check you are responsible for any additional charges ? A: Any estimate is just that - an estimate. An appraiser can only report that damage which is visible. When additional damage becomes evident as the repair progresses, a claim can be reopened and a supplemental payment issued. In fact, most large collision repairs require at least one supplement to the original estimate. Q: You will be forced to use the repair shop with the lowest bid ? A: The repair facility which writes the lowest estimate is not necessarily the best place to have your car repaired. In fact, obtaining repairs from the low bidder is usually not in the best interest of the customer. When one considers the safety issues involved in collision repair, and the considerable investment one has in his or her vehicle, the value of quality repairs becomes clear. A modern, well equipped collision repair center represents an enormous investment in equipment, training and people. As is often the case with goods and service, one gets what one pays for. Remember, the choice of shops is entirely up to you. Q: Once a car has been in an accident, it will never be the same ? A: A collision brings about many changes to an auto. It is the role of the collision repair technician to restore the safety, function and appearance of your car to pre-accident condition. Using the latest in repair technology and original parts, your car is structurally rebuilt to its factory dimensions and tolerances. Then it is refinished using the PPG's ENVIROBASE PAINTS which, in many cases, will actually exactly match the original finish . 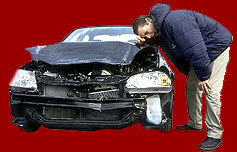 Q: My car will never be worth what is was prior to the accident ? A: Value retention and safety should be of primary concern to a collision repair customer. A inexpensive or otherwise poor repair will cause additional loss to a car owner in terms of their enjoyment of the car, safety, and return at trade-in. Substandard repairs which often go unnoticed by consumers, can lead to premature failures of the repair, inconvenience, and/or liability. Individuals with leased vehicles should also be careful in selecting body shops. Substandard repairs, which often occur without their knowledge can result in end-of-lease charge backs. Q: Once my car has been repaired the paint will never match ? A: Our factory trained color technicians can match any color. Perfectly. We guarantee it. Q: Once my cars frame is bent, it will never be right ? A: The collision repair industry has come a long way with regard to structural repairs. Years ago, a car with a bent frame was often considered a total loss due to the lack of equipment and training in these types of repairs. And unfortunately, some vehicles with bent structural members were returned to their owners without the necessary corrections made. These cars wore out tires prematurely, tracked erratically, or were otherwise unsafe. Today, however, the science of repairing collision damage has come a long way. Contemporary vehicles are held to much tighter tolerances than the ball park standards of the full frame vehicles of the 60s and 70s. For example, each example of the average Toyota will vary in dimensions as little as 3 millimeters from car to car.